Community health workers undergo training in the Kakua Chiefdom, outside Bo, Sierra Leone prior to a distribution of insecticide-treated mosquito nets by The United Methodist Church's Imagine No Malaria initiative. In a small, cramped schoolroom, in the chiefdom of Kakua, scores of dedicated volunteers are sitting elbow to elbow learning how to fight a deadly foe that creeps into their homes in the dead of night, often taking the lives of children under 5. Armed with that knowledge, on June 5 they will start swarming every household within the 15 districts and capital city of Bo, handing out vouchers for insecticide-treated bed nets. The nets will put a wall of protection between people and the deadly mosquito that transmits malaria — usually at night, when it is most active. The United Methodist Church is working in partnership with the government of Sierra Leone to distribute more than 350,000 bed nets, along with vitamins and medicine for children under 5 in a massive campaign to eradicate malaria and keep children alive and healthy. In Bo, 1,720 volunteers are going through this training in preparation for the launch of this life-saving program. Many of the volunteers are health care workers, but teachers, pastors and even students also have been enlisted to make sure the area is covered and protected. The city has a population of 650,000, and the goal is to provide three bed nets per family, depending on how many people sleep in the house. 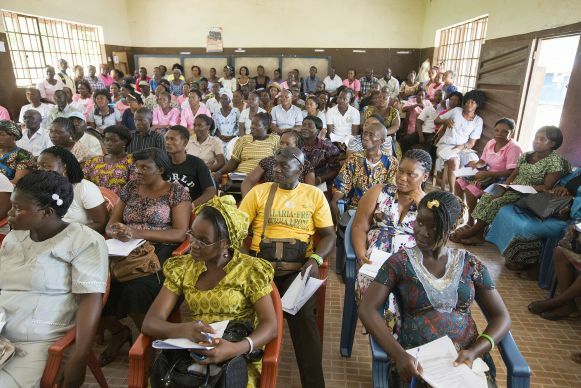 Ernest Jusu, a nurse working with The United Methodist Church’s Sierra Leone Annual (regional) Conference, is on the front lines of training these volunteers and helping them get the crucial supplies to areas that can only be reached by motorcycle or walking. “We are teaching the volunteers to understand how malaria is transmitted in language they can understand. There is a large population that is illiterate. Many also only speak Creole and Mende,” he said. Follow continuous updates and coverage from the United Methodist team on the ground in Sierra Leone. And learn more about this health outreach by Imagine No Malaria. United Methodist conference leaders are getting the word out through live radio broadcasts, congregations and word of mouth in the days leading up to the launch. Jusu is just one of a team of United Methodists in Sierra Leone passionate about making this campaign a success. They do not want to leave one family behind. Jusu was born in Bo and raised by his uncle, who was a staunch Methodist. The uncle was a strong influence on a boy who grew up to start a HIV/AIDs unit for the United Methodist Sierra Leone Conference and dedicate his life to serving others.